The talented quartet consisting of Ngozi Musa, Jade Miller, Autumne Franklin and Gabrielle Thomas are this year’s favorite to win the women’s 4x100m title this weekend. This team has clocked six program best times in this event beginning with their first mark of 44.85 posted at the TCU Invitational on March 19. At the Raleigh Relays, the foursome ran the fastest time in program and conference history – 44.56. Miller and Franklin have a chance of returning to the podium as two-time champions in the 4x100m relay after falling short of defending their 2014 title to Cornell last year. If Harvard is able to pull off the win this will be the fifth victory Harvard has achieved in this event since 1985. Cornell, the defending champions and 12-time winner of the event, seem to be the only team that will be in the race against Harvard. Adrian Jones, Udeme Akpaete, Taysia Radoslay and Ellen Shepard opened the season with a 45.55 (the fastest season opener in program history) at the UC Riverside Spring Break Invitational in late March. The team has not been able to better their mark in this event but have come close, running 45.83 at the UVA Challenge and 45.91 at the Bucknell Bison Outdoor Classic. Akpaete is the only returning member of the Cornell squad who won last year in 45.21, a time that would still place them second to Harvard in this year’s matchup. The third place team title could belong to Penn, Dartmouth or Columbia. All teams have dipped below 47 seconds in the 400m relay race. Penn’s team of Barbara Biney, Imani Solan, Allysha Davis and Taylor McCorkle have run 46.39 at Penn Relays and 46.45 at the Penn Challenge. The veteran group of seniors Kaitlin Whitehorn, Sara Kikut, Anna Kikut and Jennifer Meech ran 46.40 at the Dartmouth Outdoor Invitational on April 16. This same team ran 45.59 in 2014 putting them fifth in the all-meet top ten performances. If Dartmouth can run close to their previous time they will pose a challenge to Cornell. Columbia’s 46.56 run at the Ocean State Invitational on April 16 has made the Lions a contender for a medal on the awards stand. Iris Chijioke, Jaycee Parker, Akua Obeng-Akrofi and Ashley Cunningham will have to run a season best to have a chance of securing the third place spot. The Crimson will likely dominate the 4x400m relay event as they hold a nine second margin over the field leading up to the Outdoor Heps Championships. Thomas, Franklin, Miller and Christi Scott have run 3:32.05 this year at the Florida Relays. Harvard won this event at the 2013 championships with a time of 3:39.66 — this could be the sixth year Harvard has claimed this victory since 1987. Cornell’s Kat Quigley, Ellery Bianco, Radoslav and Akpaete will enter the championships as the second seed with their time of 3:41.40, which was run at the UC Riverside Spring Break Classic earlier in the season. Cornell won this event the past two years but their winning streak could come to an end if Harvard runs their ‘A’ team. Dartmouth and Princeton have run consistent times this season. Dartmouth’s fastest time, 3:43.54, was run at the UVA Challenge. 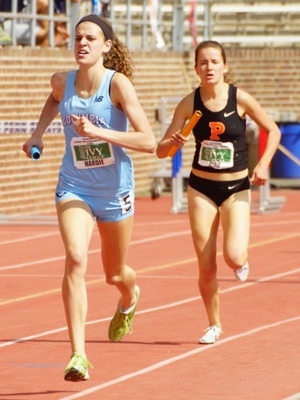 Princeton has recorded a 3:43.30 this outdoor season at the Princeton Outdoor Invitational. Princeton can easily compose a solid 4x400m relay team but the quartet of Elisa Steele, Meghan McMullin, Ashley Forte and Cecilia Barowski have run the fastest time out of all prospects in the relay pool. Columbia’s 3:50.69 is their fastest time of the season, Penn has run 3:54.98, Yale has posted a 3:58.44 and Brown’s 3:59.48 is the best time the Bears have run leading up to the championships. 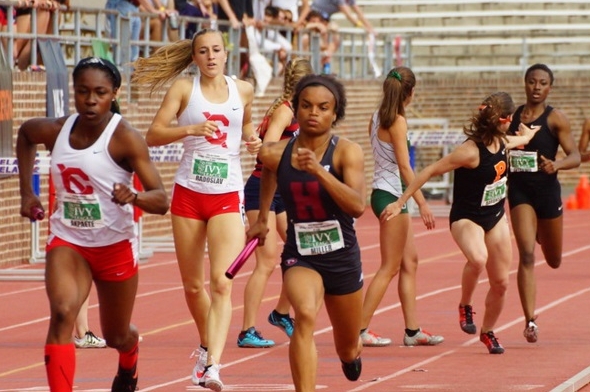 The performances at Penn Relays over the weekend provided a preview of the women’s 4x800m relay event at the Heptagonal Championships. Princeton stepped off of the track with the fastest recorded Ivy League time of the meet, running 8:32.23 (#2 in conference history) with a team composed of Ashley Forte, Barowski, Jackie Berardo and Zoe Sims. Princeton has won this event a total of ten times and topped the all-meet top 10 performance standard in 2013 with their 8:27.26 record. Columbia does not fall far behind Princeton coming into the championship meet with an 8:34.23 season best. Brittney Wade, Libby Kokes, Olivia Sadler and Sarah Hardie will have to run a strategic race and possibly split personal best times to close the two second gap between their 4x800m rival. Wade, Sadler and Hardie were part of the winning 4x800m relay team last year where their 8:38.35 was good enough for first. Penn’s team of Taylor Hennig, Gina Alm, Carey Celata and Ella Wurth ran 8:53.59, which will likely secure the third place spot on the podium. Yale has run 9:00.00 this season and Cornell has run 9:28.28. Brown, Dartmouth, & Harvard have not run this event during the outdoor season. This entry was posted on Wednesday, May 4th, 2016 at 11:00 am. It is filed under Heps Champs, Spotlight, Team Previews, Women. You can follow any responses to this entry through the RSS 2.0 feed.